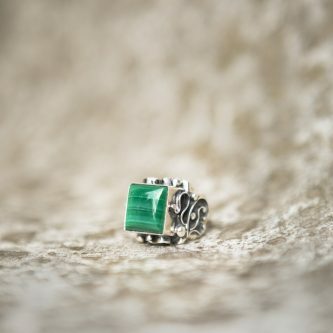 Malachite, the “archive” stone, holds the memory of everything that ever happened on the planet. Wearing it helps you to remember your consciousness roots. It amplifies personal presence and the feeling that you belong on Earth. It helps the wearer experience the core part of their Soul-Self by amplifying psychic perceptions. It opens chakras, bringing one’s past or parallel lives into awareness. In ancient Egypt, priests wore Malachite in their necklaces, while priestesses wore it in their headdresses and as an eye makeup. They did this in to order to raise their vibration and stay in contact with the Solar Council. It was told that Nut, the goddess of the sky, drops Malachite to the earth in order for people to remember their history. The pharaoh’s crown was inlaid with Malachite to help him rule justly and fairly. Drinking from a Malachite cup is believed to open one up to communication with non-human entities. Physically, it improves body circulation, helps heal sinusitis, and awakens cells for self-healing.